Photo courtesty of Wild Horse Spirit, Ltd. All Rights Reserved. 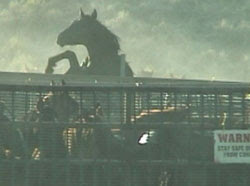 On November 18, 2009, The Cloud Foundation, Equine Welfare Alliance and 120 Organizations, celebrities and scientists in the United States, Canada, the United Kingdom and South Africa signed onto the following letter sent to the President, Congress and the Department of the Interior to rein in the Bureau of Land Management today. American Herds supports this moratorium and strongly urges everyone who cares about truly humane and appropriate management for America's mustangs and burros to add their voices to this unified call by sending THIS LETTER to your legislators and asking for their support! Also, the Cloud Foundation is asking individuals to sign this PETITION. The goal is 12,043 signatures representing the number of wild horses and burros targeted for removal this year. *Perpetuating the flawed assumption that wild horses and burros are overpopulating their Western ranges. In reality, the BLM has no accurate current inventory of the 37,000 wild horses and burros it claims remain on public lands. Independent analysis of BLM’s own numbers reveal there may be only 15,000 wild horses remaining on public lands. *Continuing the mass removal of wild horses and burros from their rightful Western ranges: The BLM intends to spend over $30 million in Fiscal Year 2010 to capture more than 12,000 wild horses and burros. This stockpiling of horses continues even as an astounding 32,000 are already being held in government holding facilities at enormous taxpayer expense. *Scapegoating wild horses and burros for range deterioration even though they comprise only a tiny fraction of animals and wildlife grazing our public lands. Far greater damage is caused by privately-owned livestock, which outnumber the horses more than 100 to 1. *Moving wild horses and burros east off their Western homelands to “sanctuaries” in the east and Midwest at an initial cost of $96 million creates significant health concerns if animals adapted to western landscapes are managed on wet ground and rich grasses. We appreciate your Administration's recognition of the horses’ value as an ecotourism resource. However, the display of captive, non-reproducing herds in eastern pastures renders them little more than zoo exhibits, further discounting the contribution to our history and the future of the American West. We believe that workable solutions to create a healthy “multiple use” of public rangelands, protect the ecological balance of all wildlife, and preserve America's wild horses and burros in their rightful, legally protected home can be achieved. We are calling on the Obama Administration to reform the BLM's Wild Horse and Burro Management Program. 1) Place a moratorium on all roundups until accurate and independent assessments of population numbers and range conditions are made available and a final, long-term solution is formalized. 2) Restore protections included in the 1971 Wild Free-Roaming Horse and Burro Act. Update existing laws that protect wild horses by reopening certain public lands to the mustangs and burros, thus decreasing the number in captivity. Return healthy wild horses and burros in holding to all available acres of public land designated primarily for their use in 1971. If these lands are not available, equivalent and appropriate western public lands should be added in their place. 3) Support federal grazing permit buybacks. Reduce livestock grazing and reanalyze appropriate management levels for herd management areas to allow for self-sustaining, genetically-viable herds to exist in the west. 4) Conduct Congressional hearings regarding the mismanagement of our wild herds and further investigate the inability of BLM to correct the shortcomings of the program as audited by the Government Accountability Office’s 1990, 1991 and 2008 reports. Castleton Ranch Horse Rescue, Inc.
Equine Rescue and Protection Humane Society of the US, Inc.
Force of the Horse© LLC. Rainbow Meadows Rescue and Retirement, Inc.